It used to be that I would never drink bagged tea and had a particularly aversion to anything CTC (cut, tear, curl). However, with a bit of education and experimentation, i came to realize there are certainly some very good and worthy bagged teas. One in particular comes to mind: Metro’s Decaffeinated Irish Breakfast. Ever since I got my hands on it, I’ve been drinking it as a late afternoon tea once a week for a few months now. I really need to invest in more Metropolitan Tea Company teas. 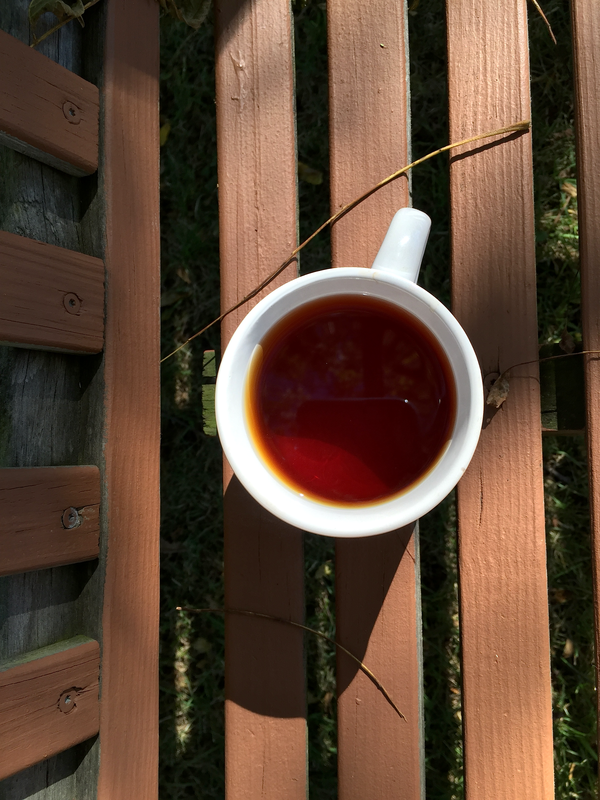 Decaf Irish Breakfast has an impenetrable coarse black-to-reddish brown liquor that shows a tinge of green along the edges.The spent leaves have a real fudgey, brownie-like quality that really swings. Pictured here with my porch swing where i’m most apt to be found when drinking it. Decaf Irish Breakfast entices with a brusque and sticky bold leaf aroma. In flavor, Decaf Irish Breakfast is a GBOP that offers all the lovely malt of an Irish Breakfast without the sinister caffeine or bitter aftertaste. As a GBOP, Decaf Irish Breakfast does not necessarily have a really discernable tea grit, but it does offer a lighter, dryer Assam curl than you’d expect. As far as CTC blends go, Decaffeinated Irish Breakfast is just tops. Decaf Irish Breakfast (Metro): loose leaf by Jocilyn Mors is licensed under a Creative Commons Attribution-ShareAlike 4.0 International License. Decaf Irish Breakfast (Metro): loose leaf Macro by Jocilyn Mors is licensed under a Creative Commons Attribution-ShareAlike 4.0 International License. Decaf Irish Breakfast (Metro): spent Macro by Jocilyn Mors is licensed under a Creative Commons Attribution-ShareAlike 4.0 International License. Decaf Irish Breakfast (Metro): liquor by Jocilyn Mors is licensed under a Creative Commons Attribution-ShareAlike 4.0 International License. Decaf Irish Breakfast (Metro): tea tin A by Jocilyn Mors is licensed under a Creative Commons Attribution-ShareAlike 4.0 International License. Decaf Irish Breakfast (Metro): tea tin B by Jocilyn Mors is licensed under a Creative Commons Attribution-ShareAlike 4.0 International License.